We are having very good experiance in manufacturing high precision plastic injection moulds for Automotive Sectors. We can achive cutomer requirments as per thier drawings. Plastic components in high engineering polymers are produced following best quality systems. We manufacture precision engineering Automobile Moulds for automobileindustry. We are using all type of engineering polymers like polycarbonate, polyacetal, nylon, acrylic, ABS, Ultem. 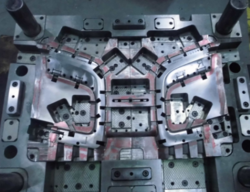 By constantly incorporating the latest mold making techniques and providing best services to our customers, our customers are giving repeated orders in this competitive market. Plastic Moulded Components for Automotive sectors.